How cute is this shirt?!!!! I am so excited to share with you guys this new tutorial! The Cricut Explore Air 2 is seriously so amazing. This was my first time using the iron on materials and it was so easy. Cricut has made it very simple and with the new machine, they have taken all the guess work out of having to figure out what material settings you need. Lets begin! Iron Open Cricut design space. Search for Christmas Reindeer. Select the image below (it doesn’t have a nose, I added that after.) 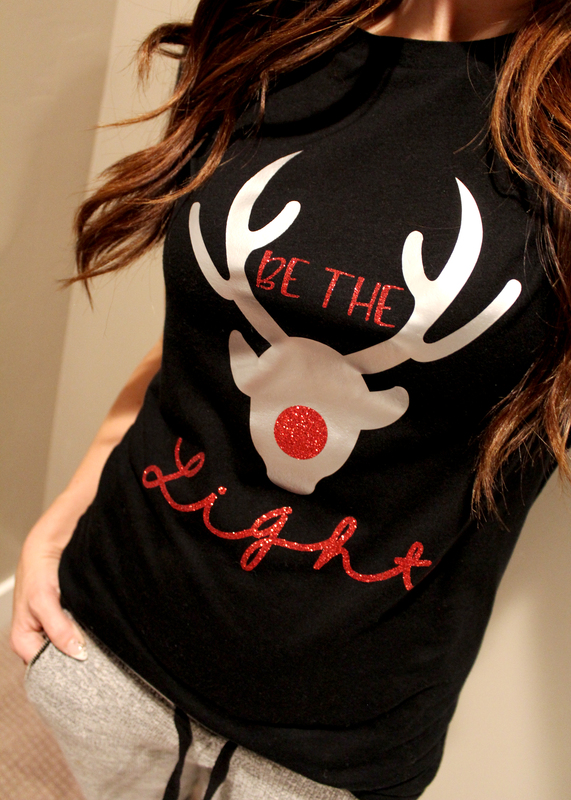 Size your reindeer to the size you desire for your shirt. Click, add text. go ahead and type, BE THE. Go to the edit tab on the upper right hand side of the design space and change the font. I used the Cricut font called, Thursday Type. Resize to fit inside the antlers. Add more text and type, Light. Change the font. I used the Cricut font called, Yours Truly. 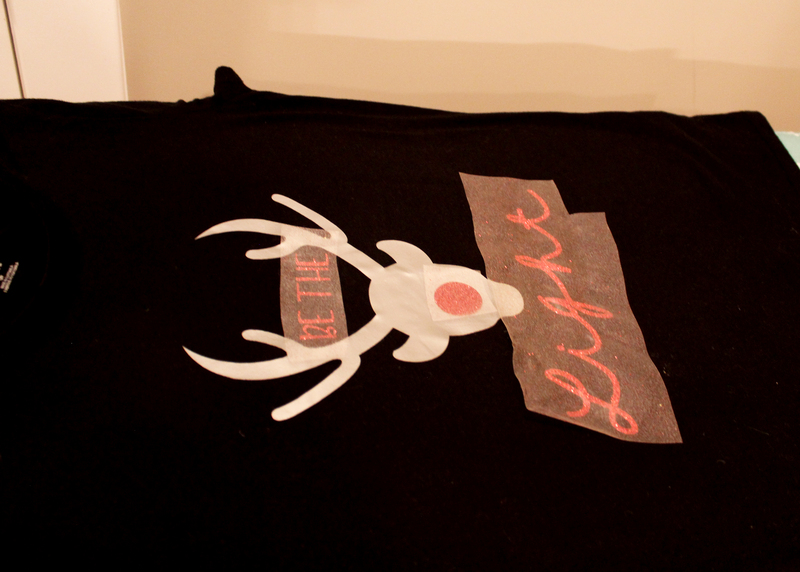 Resize to fit underneath the reindeer head. Now you will need to weld the word, Light, with the word selected, click the layers tab on the upper right hand menu bar. At the bottom of that tab, click the ungroup button. This will allow you to drag each individual letter and make them touch so they will all be connected. Once you drag them together how you like click the weld button on top of that same menu bar. You will need to adjust the size slightly again. To add the Nose. Select, insert shapes from the left menu bar. Select the circle, and adjust it to the size you want the nose. You can sync the layers of the items that will be cutting in the same color. Drag the nose, and all the wording to the same line. That way, you can cut it all out in one shot. Now we are ready to cut. Click the go button. Make sure you put your iron-on material face down. Place the liner side down like this. Here you will need to select, MIRROR IMAGE. When you are cutting iron-on you will always need to use this feature. Click GO. 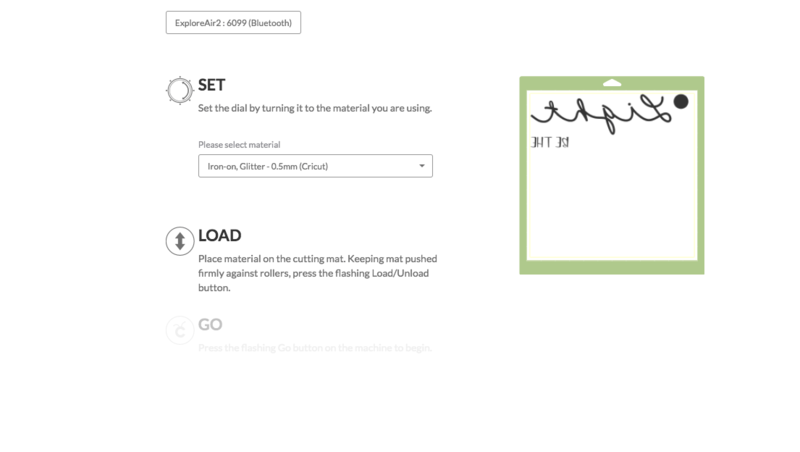 Turn the dial on your, Cricut Explore Air 2, to the custom setting. 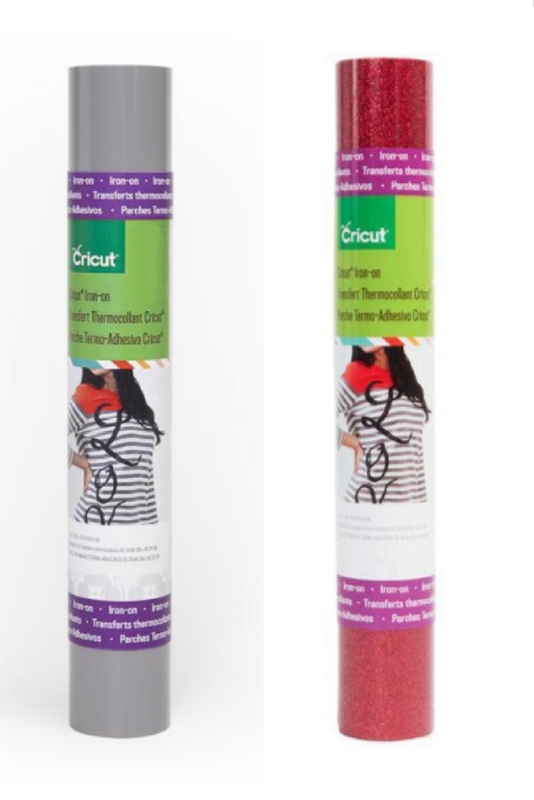 You will get a drop down box on the next page where you will need to select, Glitter Iron-on. This material is much thicker then the regular Iron-on so you will need to use this setting for it to cut all the way through. Now you are ready to cut. 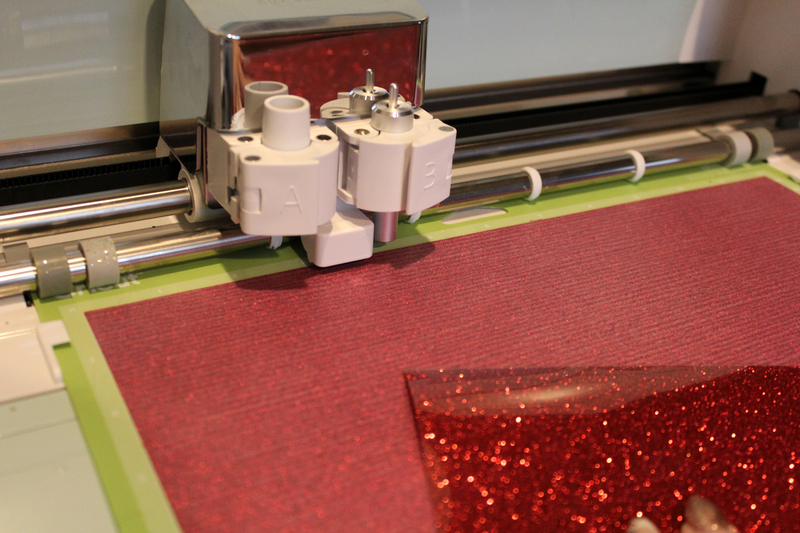 Load your mat and when the Cricut button is flashing, push it. It is hard to see what has been cut so hold it up in the light and carefully cut around each word and shape, to make the area you have to remove smaller and to save as much unused material as you can. Remove the negative, this is called weeding. You will end up with something like this. The machine does a “Kiss Cut” which means it only cuts through the material and not the liner. That way you can transfer it to your shirt and keep it all intact. 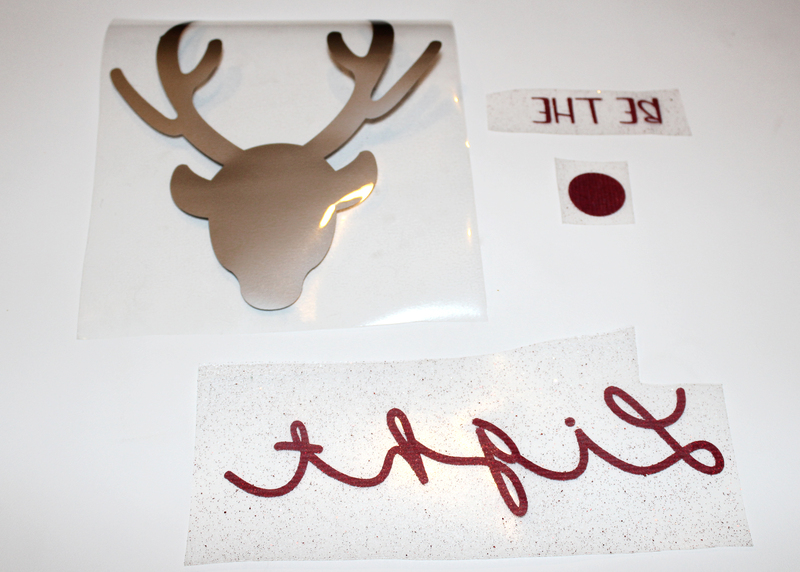 Follow the same steps for the Grey Iron-on to cut out the reindeer head. 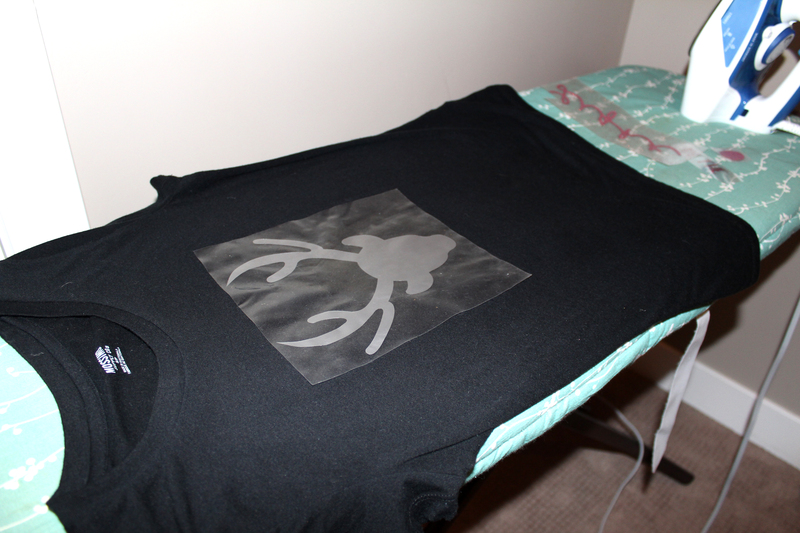 You can use the dial and choose the Iron-on setting with this material. It is the normal weight and will cut perfect with that setting. Once all you materials are cut and weeded, you are ready to iron it on. First place the Reindeer, centered where you want it. Follow the Iron-on instructions on the inside label of the material. 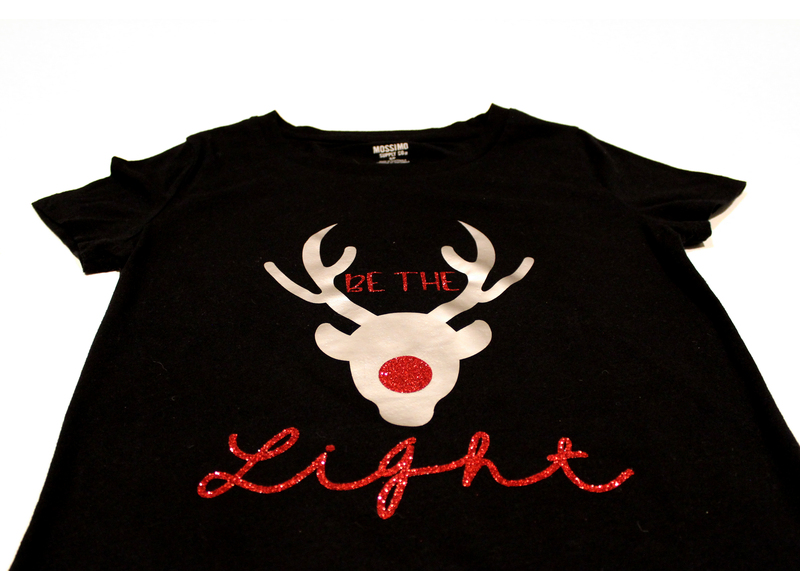 Once you have the reindeer on add the words and nose and follow the instructions again. *I USED A LIGHT WEIGHT PIECE OF MATERIAL ON TOP OF THE LINER I FELT LIKE THE LINER WAS GOING TO STICK TO MY IRON. Look how awesome it looks!!!!!! That was so easy and looks perfect. 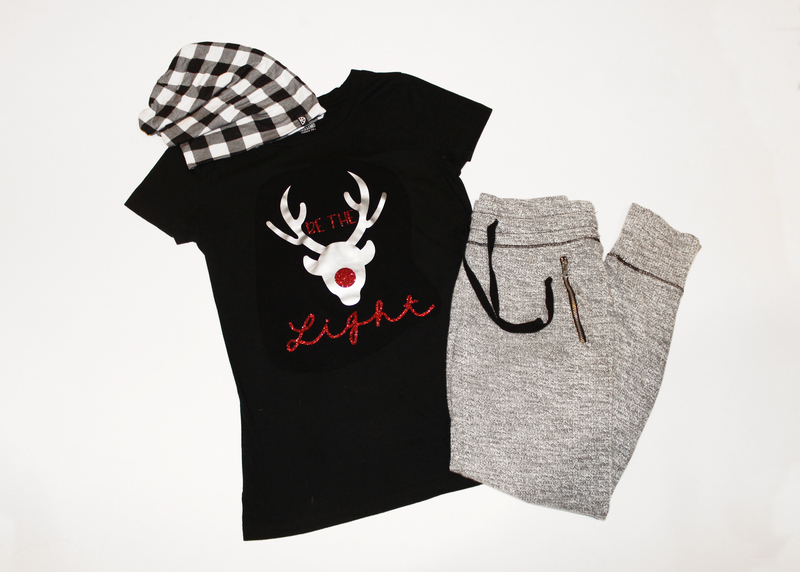 Here I styled it with my favorite Joggers from American Eagle, and a slouchy beanie from Sugar Lime Lane. LOVE, LOVE, LOVE!!!!! 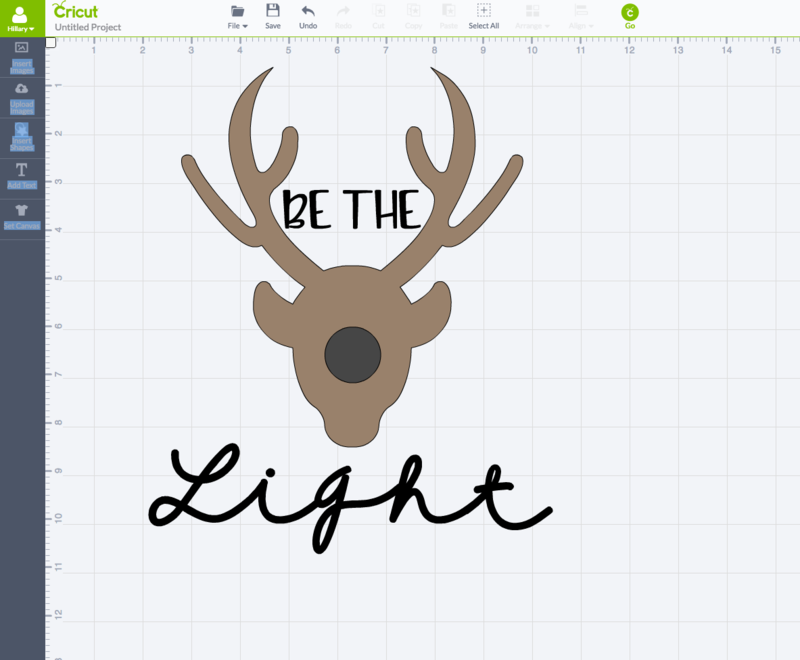 I hope that you had so much fun making this project on your Cricut Explore Air 2. The possibilities are seriously endless. I am going to be making a lot of t-shirts in the near future!!! Thanks so much for support, you guys are amazing! If you have any questions, feel free to leave comments below.